It is exciting times for the hockey charity formerly known as The Kadish Foundation as it spreads its operation further across Africa and changes its name at the same time. Now known as the Hockey Dreams Foundation, the organisation was born nearly five years ago when Gijs Hardeman came to the end of a five month contract with the Dutch Hockey Association (KNHB), during which time he had been working as a Development Coach in Lusaka, the capital of Zambia. The KNHB had become involved in the first place to promote a sustainable hockey culture in the African country. Hardeman knew that, for the plan to succeed, a more permanent organisation was needed. The key point about the Hockey Dreams Foundation is that it is all about developing the local people and giving them the skills to organise, administrate and coach hockey. Hardeman and his team are very much there to support, guide and question but, for the vision to be realised, the ownership has to be in the hands of the local population. While guidance and support might come from the sponsored office in Amsterdam, the work is being delivered on the ground by Africans who are keen to make sports coaching and sports administration their career. Not that Hardeman is thinking of hanging up his boots yet. The Dutchman has taken a back seat from the day-to-day running but still questions, offers advice and criticism and keeps a watchful eye on the organisation. 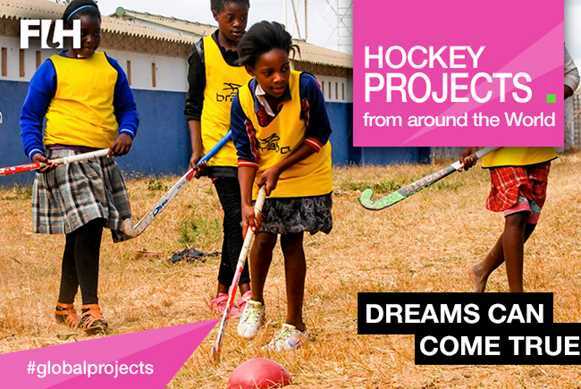 From its starting point in Zambia, The Hockey Dreams Foundation has spread its reach to Malawi, Uganda, South Africa and, in a geographical quirk, Colombia. The name change mirrors this international spread. Hardeman sees this as a natural progression. So how does the Foundation work? The first thing to point out is that this is no easy ride for the would-be coaches. “We ask three things of our coaches,” he explains. “They must be in education and trying to develop themselves. We have guys who are stuck in grade 12 and we try to help them get over that, but they have to do the work. The third requirement is for the coaches to take responsibility for a project within the larger Foundation programme. This could mean running the Hockey5s league, coaching a girls only club or working on equipment donations. When the programme started, Hardeman realised that the only way he could get coaches would be to pay them. The levels of poverty in Lusaka were so great that relying on volunteers would not be an option. He worked out that €6,000 per year would be enough to pay 10 coaches the equivalent of the minimum wage. It is an investment in people that is already seeing benefits. The oldest coach on the programme is a 35-year-old woman who was illiterate when she joined the programme. She is now working her way through evening school while coaching during the day. A few more years catching up on her schooling and she will be able to get on a course or start her own business – that, says Hardeman with justifiable pride, is how the Foundation makes dreams come true. This project is very much in line with International Hockey Federation's 10-year Hockey Revolution strategy, specifically in line with one of its Big Goals to increase the degree of professionalism in the sport. For more information about the Hockey Revolution, click here.